OK so I bought a bag of hemp seeds weeks ago and I’ve been ignoring them ever since, what do you do with them? How do they work? What do they taste like? Are some of the things I would murmur in panic under my breath when they caught my eye as I reached for some peanut butter. Today, in light of recent chocolate indulgence, it was time to bit the bullet. All I’ve done here is toast a killer combo of nuts and seeds and added salt, do not be underwhelmed due to its simplicity, this is a good good thing. Get them on a chopping board, crush them up a bit leaving some large chunks here and there. Put some heat under a frying pan and just straight up dry fry them for about 10 minutes. After 8(ish) minutes sprinkle some sea salt in there too. 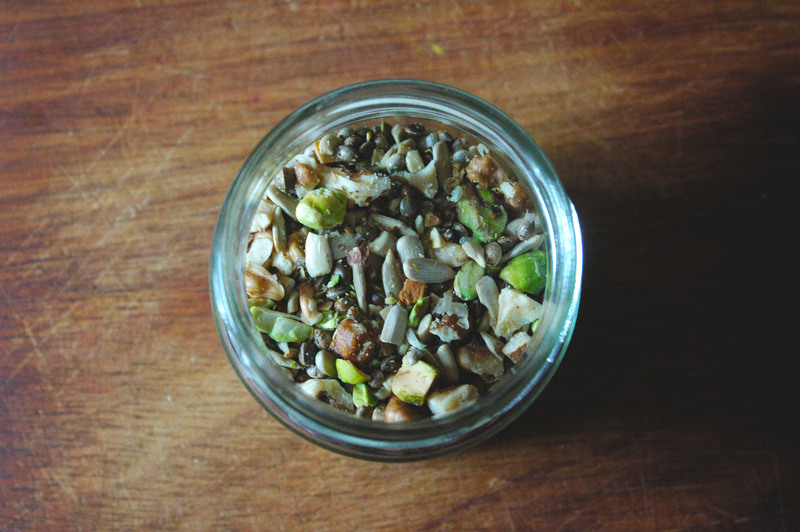 You’ve now got a jar (or whatever you put the finished product in) of goodness that you can add to salads, sandwiches, your breakfast, dessert, it goes with anything. Enjoy.